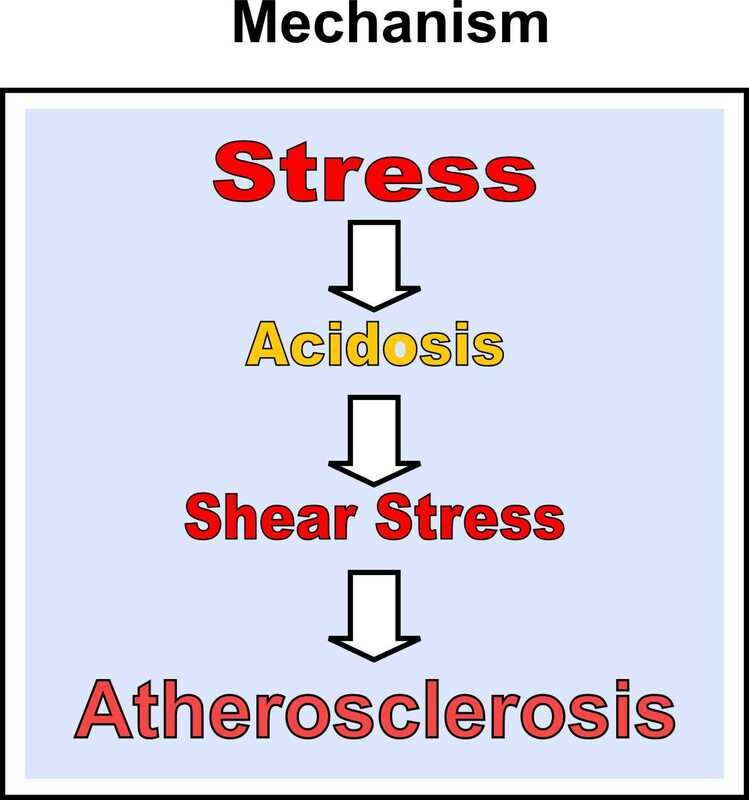 New Evidences: Acidity Theory of Atherosclerosis: Sympathetic predominance: a primary factor in the cascade of events leading to the atherogenic spiraling. Sympathetic predominance: a primary factor in the cascade of events leading to the atherogenic spiraling. Sympathetic overactivity has been found to be associated with blood pressure and lipid abnormalities (1,2,3). In this respect a recent study has demonstrated that sympathetic overactivity may favour the development of sustained hypertension and hypercholesterolemia early in life, and lead to increased susceptibility of vascular complications. (4). In fact accumulating data collected in animals and humans suggest that metabolic syndrome is associated with markers of adrenergic overdrive. Several markers of adrenergic drive, such as plasma norepinephrine, norepinephrine spillover from adrenergic nerve terminals, heart rate and others, have all show an increase in the different conditions clustering in metabolic syndrome like obesity, hypertension and insulin resistance state (5,6). Evidence also has shown that the sympathetic activation participates in the development of hypertension-related target organ damage, such as left ventricular diastolic dysfunction (7). It is well established that the sympathetic nervous system (SNS) activity is also influenced by food ingestion, and that diet composition plays an important role. What is interesting to note is that, among dietary types, carbohydrates (starch and sugars) ingestion significantly increases SNS activity, especially in high-glycemic load, with deleterious effects to human health (8). On the other side protein or fat ingestion have no significant sympathoexcitatory effect (9,10,11). 1. Masuo K, Mikami H, Ogihara T, Tuck ML. Sympathetic nerve hyperactivity precedes hyperinsulinemia and blood pressure elevation in a young, nonobese Japanese population. Am J Hypertens 1997; 10:77–83. 2. Nakao M, Nomura K, Karita K, Nishikitani M, Yano E. Relationship between brachial-ankle pulse wave velocity and heart rate variability in young Japanese men. Hypertens Res 2004; 27:925–931. 3. Arner P, Wahrenberg H, Lonnqvist F, Angelin B. Adipocyte betaadrenoceptor sensitivity influences plasma lipid levels. Arterioscler Thromb Vasc Biol 1993; 13:967–972.